When I was pregnant with my second child and found out she was a girl, I was so excited. The main reason being that I could design her nursery! I think that doing a baby girl's room is so fun. I love all the soft colors and the whimsy you can create that wouldn't work anywhere else. I have a love for older, romantic styles and knew that was the look I was after. I saw this room done by Candice Olsen on HGTV's Divine Design and used that as my inspiration. (isn't it amazing?) This is what I came up with. It all started with the bedding. When I design bedrooms I find that bedding is a great place to start because it is such a large element. I found the bedding online and its made by Cocalo Couture. It was the perfect combination of tradition and contemporary and in the color scheme I wanted, pink and green. The walls we painted pink and the faux paneling was created with tape, white paint, and a very talented husband. I love the look and it was a great way to break up all those pink walls. The dresser was actually my mom's as a child. It had been in every house I can remember growing up and was UGLY! It was painted cream, avocado green, and mustard. All it needed was a fresh coat of white paint and new knobs. I'm sure it has many, many years of life still in it. I put a cute cork board above the dresser and have cards and mementos from her birth displayed there. When I found the wire coach, I HAD to have it! The changing table is a nursery necessity. I love having baskets with easy access to all my diapering supplies and toys. The bottom shelf is a perfect spot for extra linens. I painted a craft store shelf white and hand painted the motif from the bedding. The letters that spell my baby's name I also painted using the bedding. It was intimidating when looking at the print as a whole, but when I broke down the elements piece by piece it was a cinch. The greatest compliment I got was when someone said "I thought it was wallpaper." I also found some great princess art on PoshTots website. Since I couldn't afford so much as a knob from there, I decided to recreate them myself. 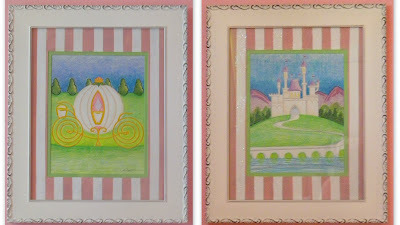 They are simple, colored pencil drawings put in hand painted mats and white frames. I find that if your art is mediocre, a great mat and frame can make all the difference. The window treatment really made the room come to life. I hung them floor to ceiling not only for drama, but light control. We have an arched window that streams unwanted sunlight in at the crack of dawn. The sheers behind were store bought and the green panels were made by me. They are simply constructed with the fringe attached by fabric glue. I really wanted to put a crystal chandelier in here and this room would have been perfect for it. However, my baby was born in July and it was hot! We really try not to use the air as much as possible, so we decided a ceiling fan was a must. When I found this one at Lowe's, for under $100 no less, I felt it was the perfect compromise. 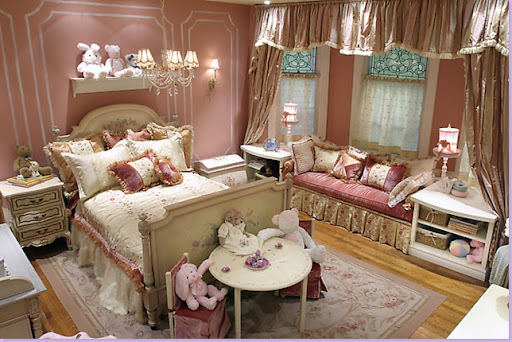 So there you have it, a nursery fit for a little princess. Simple updates make me happy!